The station has excelled at online personality branding, with Jason DeRusha leading the way in all online channels but also with the emergence of Esme Murphy‘s and Amelia Santaniello‘s strong online presence, among others. They’ve done a great job thus far of cross-channel promotion, understanding that Television is, among all media channels, the largest driver of online traffic. WCCO TV began their popular “bloginars” as a tool to understand the local blogosphere. Not long ago, Kiki Rosatti, the station’s Director of Communications, launched her PR blog to cater to media and bloggers about station news. Most recently, Daenzer unveiled ‘CCO’s High School Sports Rally project to aggregate user-generated content about high school sports; it’s a great idea that harnesses the passion of high school athletes for their sports; parents’ passion for their kids; and Minnesotans’ passion for youth sports in general. John Daenzer’s newest project is the station’s most ambitious to date. The Wire is an online application that will harness WCCO TV viewers’ (and non-viewers) conversations around the news while encouraging collaborative journalism. 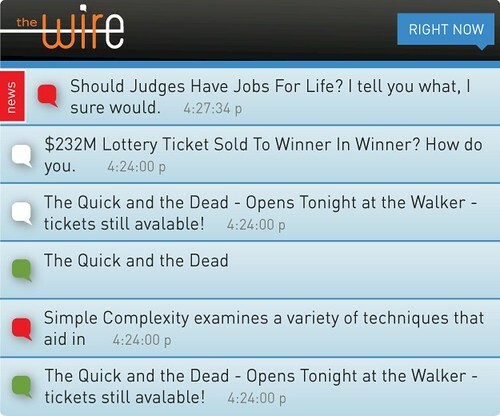 The Wire will be a new Web site that hosts live conversations among users and ‘CCO staff around a highly interactive timeline around news and events and entertainment. Users will be able to follow (and contribute to) story development and get a peak behind the scenes at WCCO. 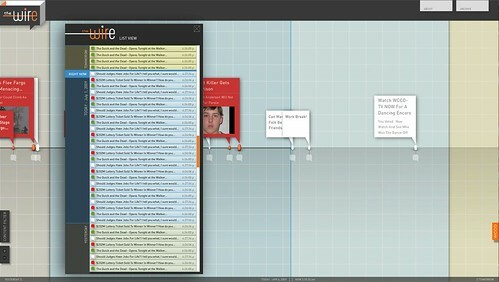 The site will give users the opportunity to comment on, offer context, and even influence a given story, as it develops. I do believe these concepts of collaboration and transparency are ultimately where journalism is heading. It’s already happening informally but ‘CCO being smart about it by getting ahead of the trend and leading the process. One of the reasons I like John’s work so much is challenges he faces within a corporate news organization in justifying the bottom line. The Wire is no different; it will create a tighter bond between online activity and the station’s actual news broadcasts and as a result, will likely drive viewership and increase loyalty by becoming part of the overall WCCO news experience. It will also create a new channel for WCCO’s advertisers to deliver relevant, time-based ads as well as a brand experience for sponsors. Attendees of WCCO’s next bloginar will get a sneak preview of The Wire. John’s project just adds to Minnesota’s continuing online innovation. I can’t wait to see it live. Great overview! As the WCCO food blogger, I’m eager to see our readers and viewers get in on the action. As shown with JasonCam, folks like to interact and share thoughts if given the right forum. you got rid of Jeanette for “finding Minnesota” and “the goods”? Baaaaad decision! I like to see the anchors read the news. I do NOT like to see them with promos and teasers all afternoon and evening. Why must you start the news broadcast with 2 or 3 stories coming up, then go back to the first story? Please, just start with ONE story. Thank goodness for remotes!